Off of Highway 22 in Prospect KY, you will find the gorgeous subdivision known as Moser Farms. Houses in Moser Farms typically range from $300,000-$500,000. In Moser Farms, you will find approximately 170 homes. Construction for this subdivision began in the late 1990s to the early 2000s. Almost all homes in this neighborhood have a basement. The average number of bedrooms found in homes in Moser Farms are four bedrooms; however, a few homes have three and some have five or six. The majority of the houses in this subdivision are all brick but some homes do have partial stone or siding. If you are a nature lover, Moser Farms would be a great place to call home. In the neighborhood, there is a 10-acre nature preserve. The nature preserve includes hiking trails, a pavilion, and a playground for children. Moser Farms does have an active Moser Farms Home Owners Association. 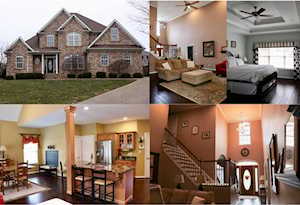 The Hollinden Team updates this search for Moser Farms homes on a daily basis from the Louisville MLS. Click the map to the left to view each home for sale in Moser Farms. There is a satellite view button in upper right. Moser Farms is an extremely convenient location to shopping, expressways, entertainment, and restaurants. The Paddock Shops, formerly known at The Summit, is only three miles away. Walmart is only four miles away and Kroger is about six miles away. If you live in Moser Farms you may want to check out the following nearby restaurants: The Blackstone Grille, Captain’s Quarters, Cast Iron Steak House, Bistro 42, and Cunningham’s Creekside. Also, there are several great restaurants at the Paddocks such as Martini Italian Bistro, Mitchell’s Fish Market, and Five Guys Burger and Fries. If you love to golf, you will love living in Moser Farms. You can walk to Glen Oaks Country Club from Moser Farms. Glen Oaks golf course is an 18-hole course that is considered to be a championship course. Moser Farm residents are able to set up a membership at Glen Oaks Country Club if desired. A few other golf courses that you may enjoy in the area are Hunting Creek Country Club, Nevel Meade, and Sleepy Hollow. The home elementary school for Moser Farms is Goshen Elementary. The home middle school is North Oldham Middle. The home high school is North Oldham High. If you would like to learn more or have any questions about any of these Moser Farms houses for sale, or others in the zip code 40059, just click the "Request More Information" button on any property detail page. The REALTORS at the Hollinden Team can provide you with past sale information, comparables, disclosures, PVA assessment, and tax information – we would love to answer any real estate questions you have.